Rookie quarterbacks Sam Darnold and Josh Allen figure to be AFC East rivals in the coming years. However, their first NFL matchup is likely on hold. Darnold, the third overall pick in the 2018 draft, and Allen, the No. 7 selection, are both uncertain to play Sunday when the New York Jets (3-6) host the Buffalo Bills (2-7). Allen is nearing a return from a strained elbow that has sidelined him for three games but was only a limited practice participant for the Bills on Wednesday and Thursday. Darnold will not start Sunday after he was unable to practice Wednesday and Thursday while wearing walking boot to protect a strained foot he sustained last week in New York's 13-6 loss at Miami. "Obviously, I want to be out there with the guys," said Darnold, who might be active against Buffalo as a backup. "I want to go out there and play. Hopefully, if I'm able to go out there and play Sunday, I will. If not, I'm just going to treat it as another learning experience. When adversity hits, it's up to me to respond. That's all I can worry about." Darnold has faced adversity on the field during the Jets' three-game losing streak, throwing seven interceptions and only two touchdown passes. For the season, he ranks near the bottom of the league with a 55 percent completion rate, 68.3 passer rating and 14 interceptions. The Jets will start 39-year-old quarterback Josh McCown, who went 5-8 as the team's starter last season, completing 67.3 percent of his passes with 18 touchdowns and nine interceptions for a passer rating of 94.5. Both the Jets and Bills enter bye weeks after the Sunday game, offering additional time for the ailing quarterbacks to rest their injuries. "We don't want to rush things," Darnold said. "That's one thing we don't want to do. I'm eager to get back out there on the field with my guys, but at the same time, I've got to take care of my body, first and foremost." Allen is listed as day-to-day and has not yet been able to fully participate in practice. He just started throwing again last Friday. "We're still taking it precautiously," Allen said. "Anytime it's your throwing arm, your throwing shoulder, throwing elbow, whatever it is, you never want to push it too hard because you don't want to feel any discomfort or pain or whatever it is in there. I'm just taking it day by day, throw by throw, really." 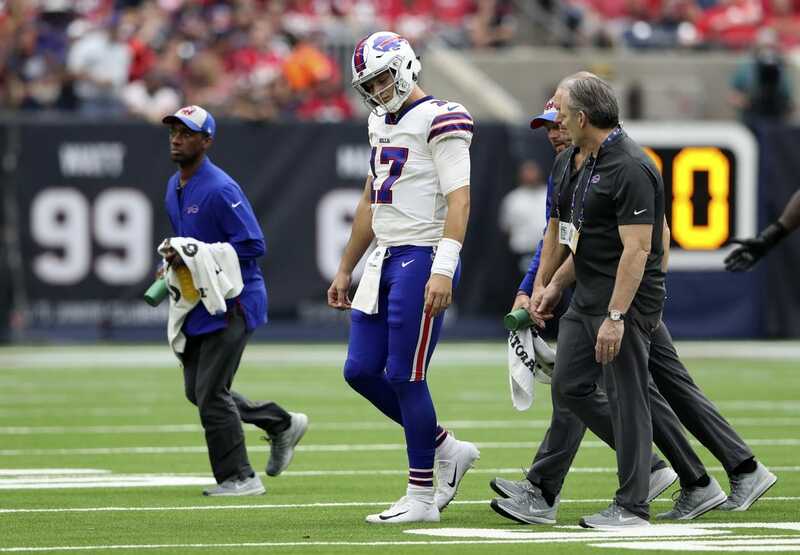 The Bills likely would turn to embattled second-year quarterback Nathan Peterman again if Allen can't play. Veteran Derek Anderson, who started the first two games Allen missed, remains in the NFL concussion protocol for a second week. Peterman threw three more interceptions Sunday in a 41-9 loss to the Chicago Bears. He's been intercepted seven times in 81 attempts this season. For his career, Peterman has thrown 12 interceptions in 130 attempts and has a passer rating of 32.5. Regardless of who starts at quarterback, the Bills' offense has struggled, scoring just two touchdowns during a four-game losing streak. Buffalo's 96 points scored are a franchise low through nine games and the fewest in the league. "I'm frustrated just like our fans are frustrated," Bills coach Sean McDermott said. "When you put in the amount of time that we put in, to get the results we've gotten, on that side of the ball in particular, leaves you frustrated, leaves you empty-handed."